Goal setting is very important to achieving our desires. We have to know what the target is before we can hit it. But goal getting is the next step—taking action to get the goal you set. 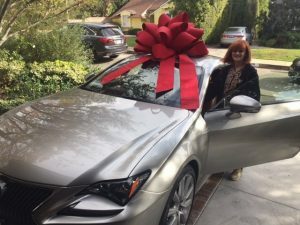 Now, you need to understand that at this particular moment in my life, my business was going very well and I was making good money, but I thought that there was no way I could really afford to buy a Mercedes Benz. My belief was that those cars were driven by rich people and movie stars. Well, I wasn’t that rich and I certainly wasn’t a movie star, so I “just knew” I couldn’t have one. I had already looked at and was ready to buy another, medium-priced car. We proceeded to calculate the costs of this purchase. She gave me a great deal and it turned out not to be anywhere near as expensive as I thought. In fact, the monthly payments were only thirty-two dollars per month more than the other car I was going to buy. I thought about how many times I might have stopped myself from having things I wanted merely because of a mistaken belief. Goal getting is knowing what you want, investigating what it will take to have it, and then taking the action steps to have it. What often happens is that you get it a lot sooner than you expect. I said, “Green. Want to see it?” And I took him to the parking lot and showed him. Okay, full disclosure here: I leased the Mercedes instead of leasing the Acura. It’s true that the lease payment was only $32 more for the Mercedes – it was $500 a month and the Acura was going to be $468. But the Mercedes was a more expensive car, so the balance owing at the end of the lease payment was more than I would have owed on the Acura. But I was more concerned with the monthly payment at the time, rather than the actual cost of the car. I think it turned out for the best, regardless of the money, because driving the Mercedes was like living an affirmation that I was rich and successful! It made me feel so good, and rich, and prosperous that I exuded that feeling throughout the day in my work and in my networking. I know it showed in my happy energy everywhere I went. Years ago, when I was teaching my workshops in the conference room at my bookkeeping service business, a few students and I walked out to our cars together. One of them, a guy named Ron, said afterward that they watched me as I walked to my car. There were two cars parked in the direction I was walking – one was an old nondescript car and the other was my bright, shiny green Mercedes. He told me they were so glad to see me getting in the Mercedes! Since I was teaching them about making money and being successful, they wanted to see visible proof that I had the goods, see? I remember another prosperity speaker and author I used to see at some of my networking meetings. He drove a 15-year-old car that had dents and needed painting. It just didn’t match his talk. Yeah, yeah, I know this is all outward appearance stuff, and so Hollywood and all that. But ya know, nice stuff is nice! So this year, after driving a Lexus SC 430 for 10 years and loving it every minute, at 104,000 miles it was needing repairs. I don’t want any breakdowns on the way to a speaking engagement, or driving home late at night from a poker tournament. So I got a new Lexus RC 350 with a great deal through my wonderful broker Bridget Stennis (bridget.stennis@gmail.com). Merry Christmas and Happy New Year to me! If you’d like to make more money, afford more nice things, and take more time off for fun, contact me about the next Financial Stress Reduction telecourse at chellie@chellie.com or call me at 310-476-1622. I love helping people be prosperous and happy!